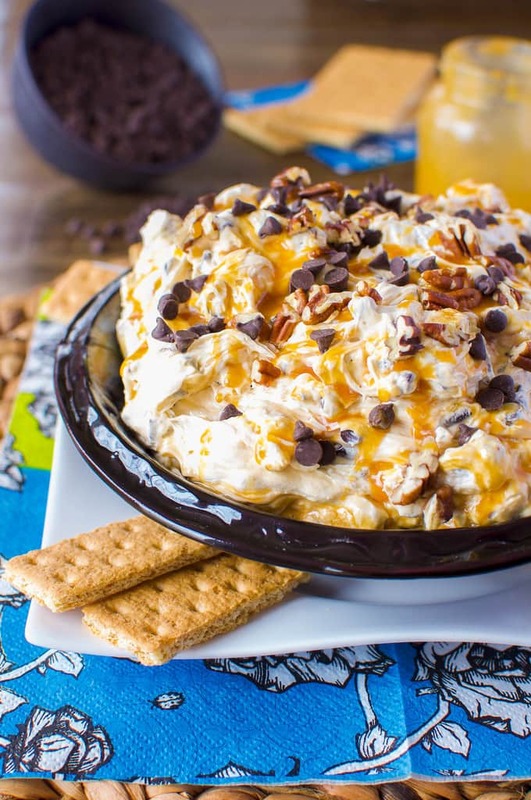 No Bake Turtle Cheesecake Dip is cool, creamy, and completely decadent! The cheesecake base is swirled with caramel and loaded with chocolate and pecans! If you are looking for an easy, no bake dessert to bring to parties and potlucks this summer – look no further! 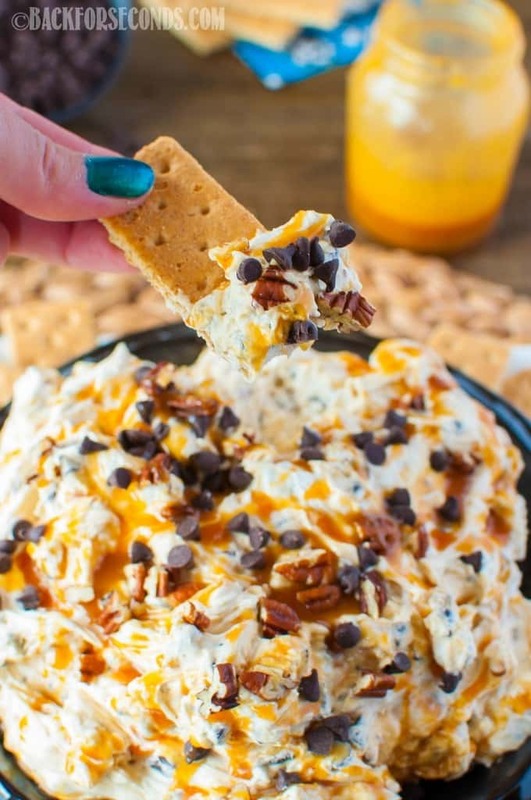 This No Bake Turtle Cheesecake Dip is out of this world delicious and it couldn’t be easier to make! My husband is a big fan of the turtle cheesecake custard from Culver’s, have you tried it? While I was thinking of more no bake desserts to make for the summer time, I was inspired by his favorite frozen treat. This dip turned out even better than I imagined! Once you start dipping, it’s seriously hard to stop!! 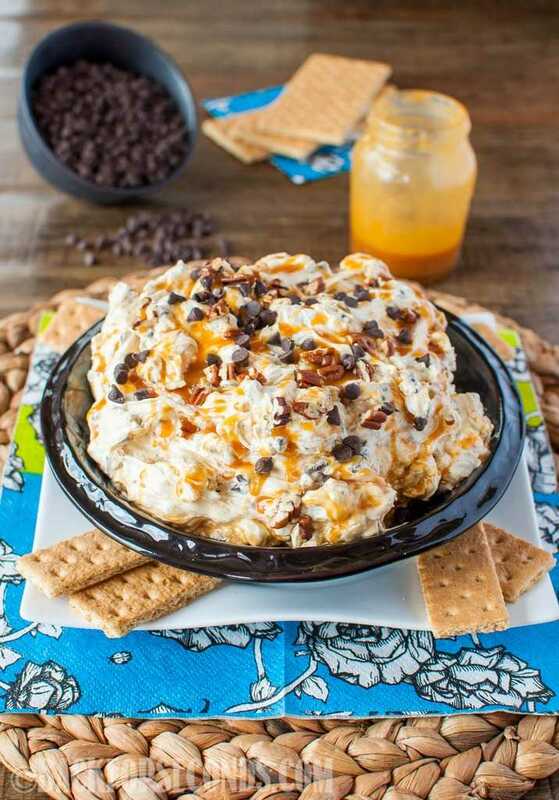 The thick, creamy, slightly tangy cheesecake base is swirled with sweet, rich caramel, and lots of chocolate and pecans are stirred in to make one unforgettable dip! You’re going to love it! that looks sinful!!! love how you have swirled the caramel sauce on top!!! Totally droolicious!!! Heaven help me if I had that in our house. That would be such a temptation. Forget the crackers — just hand me a soup spoon and yes I’ll double dip — several times. I’ve GOT to make this ASAP! OMG. This looks amazing. I’ve not really had sweet dip much. I’m sure I would be hanging around this at the table. Now, this dip is insanely scrumptious! How could someone refuse something so indulgent? I have a terribe sweet tooth nowadays, summer is not a great season for keeping away from yummy stuff. Love this recipe!